Police requested the Team go to the assistance of a family with 7 members, stuck in a 4 x 4 vehicle on the Coach Road between St Johns in the Vale, and Dockray. This road is not a highway in the usual sense, but a rough track often used by 4 x 4 enthusiasts, mountain bikers and walkers. As it can be accessed from both ends, we requested the assistance of Patterdale team to work from the other end, which might prove to have easier access. In driving snow, the Team turned out three vehicles, to be able to retrieve the occupants (which included three young children) to safety. As the vehicle concerned was off the road, and stuck behind another 4 x 4 (which was also stuck but not requesting assistance) , the Team confined itself to saving life, rather than acting as a recovery service. 5 members of the family were taken to a place of safety by Patterdale MRT, as their route out was less dangerous, whilst 2 stayed behind overnight with their vehicle. 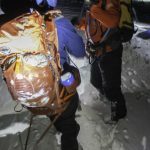 The Team then returned to their vehicles, and managed to extricate themselves back to the tarmac with the use of snowchains – an essential in the conditions. 16 Team members – 3 hours 56 minutes.